Welcome to At The Ballpark Cards! We offer an assortment of Sports Cards in sealed boxes, team sets, lots, and singles. We also carry inserts, Autographs, and Game-Used Memorabilia. We combine shipping on everything, so Stock up and Save! Please look around and send us your questions!! 2018 Topps Series 1 2 Update Atlanta Braves Team Set (38 Cards) Albies Acuna RC! 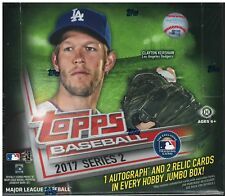 2017 Topps Series 2 Jumbo HTA Box from Case! 3 Hits Per Box Free Shipping! 2015 Topps Series 1 2 Update New York Mets Team Set (42 Cards) Syndergaard RC! Lot of (5) 2019 Topps Series 1 Silver Packs Trout Bryant Ohtani Auto's! 2018 Topps Opening Day Shohei Ohtani RC Rookie Lot of (10) #200 Angels Nice! 2016 Donruss Football Sealed Set (400 Cards) Prescott, Elliot, Wentz, RC's! 2008 Bowman Chrome Hobby Box fresh from case Free Shipping! Jake Arrieta RC! 2017 Topps Sealed Hobby Set (700 Cards) Aaron Judge RC PLUS 5 #'d Parallels! 2017 Topps Toys R Us Purple Parallel Mike Trout #20 Angels Nice Rare!